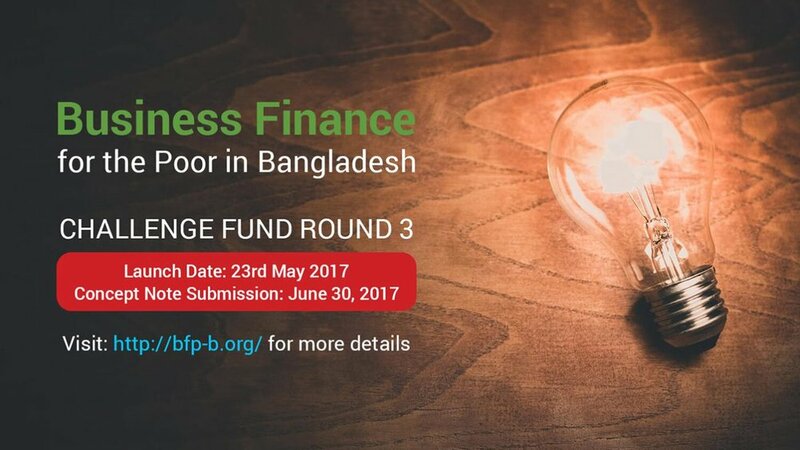 The third round of the Business Finance Challenge Fund (BFCF) will be launched at the Lakeshore Hotel of Gulshan in Dhaka tomorrow. BFCF is a component of “Business Finance for the Poor in Bangladesh (BFP-B)”, an UKaid programme. The challenge fund has been established to support the testing and development of innovative approaches to financing micro and small businesses. This is a unique, competitive, transparent mechanism through which organisations can apply for grant financing for projects that will ultimately benefit the poor of Bangladesh. The BFCF grant will have three windows for applications this year with a fund commitment of GBP 6 million; window 1: Business Development Services to Improve MSE Access to Finance; Window 2: New Products, Delivery Channels and Business Models to Increase MSE Financing and Window 3: Supporting Women Entrepreneurs’ Access to Finance. Chris August, Team Leader BFP-B, will inaugurate the workshop. Buddhika Samarasinghe, Director of Nathan Associates London; Arafat Hossain, Challenge Fund Manager and Muhymin Chowdhury and Deputy Challenge Fund Manager BFP-B will present the challenge fund principles and application process in detail to the participants. The deadline for submitting the first stage of the application process, a short concept note, is June 30, 2017. Concept note guidelines, forms and all the required information are available at the BFP-B website, Facebook, LinkedIn and Twitter pages.